It isn't hard to find zombie-themed ads lately, and with the mega-ratings success of "The Walking Dead" Season Four premiere, that likely won't be changing. Still, not all zombie ads are equally infectious -- which is why "The Getaway" spot from DieHard battery deserves a shout out. In 70 short seconds, the ad by Y&R Midwest agency and directed by Tom Routson is immediately evocative of a solid horror flick. The viewer quickly gets the sense of the relationship at play in this zombocalypse as a man and woman try to flee from an undead horde. But instead of going for cutesy, the DieHard spot manages to offer up some survivor vindication with a humorous twist without having to pull too many punches. 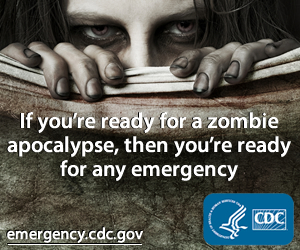 It is a fast, dark, fun advertisement befitting the zombie genre. Check it out, and tweet the hashtag #SurviveZombies for a 10 percent off DieHard products at a Sears.com zombie site. For more zombie ads, check out Adweek's ongoing list.